When standard eyeglasses cannot provide you with sufficient vision, and medical treatment, such as surgery, is not a suitable option for you – it’s time to consult with our doctors about the most helpful low vision aids! Low vision aids and devices come in a wide range of designs and powers. From simple handheld magnifying lenses to advanced electronic devices, our recommendations are personalized to meet your lifestyle needs and diverse visual requirements. Optimal eye care for low vision begins with a thorough eye examination by an eye doctor or low vision expert. This eye exam is not the same as routine vision testing or an eye health exam; the results will help our doctors match you with the ideal low vision Aids available in our New York office. Regardless of whether Low Vision is due to macular degeneration, glaucoma, cataracts, diabetic retinopathy or another visual impairment, there is a low vision device to improve your independence and quality of life. Tools to Enhance Your Sight. Most devices to assist with low vision are categorized as either optical, electronic or non-optical. Each type of tool is geared toward a different visual task. Therefore, patients generally require a few different low vision aids in order to maximize their sight under a range of circumstances. A TV system in which signals are not publicly distributed but monitored, mostly for surveillance and security purposes. It relies on strategic placement of cameras, and observation of the camera’s input on monitors somewhere. 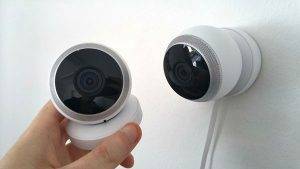 These gadgets typically magnify between 1.5 – 20 times. They come in foldable types that tuck into your pocket or purse easily, and some feature battery-powered lights. Low Vision glasses can help you regain your independence and enjoy life. Whether you are having trouble driving, reading, seeing faces or walking safely, we have the solution. Reading glasses with enhanced UV light protection reduces the glare which can improve the ability to see clearly. Come with enhanced blue light protection, ideal for protecting your eyes while on the computer. The computer offers the ability to learn about the world, stay in contact with loved ones, and work. Low vision people have trouble using a computer due to resolution, contrast, size, and more. With the latest software designed for the visually impaired, computer use is attainable. Both eyes are used to see far into the distance; many lens powers and sizes of binoculars are available in our San Jose optometry clinic. A compact device with insightful functionality. Hear any text, appearing on any surface. Recognize the faces of people in your life. 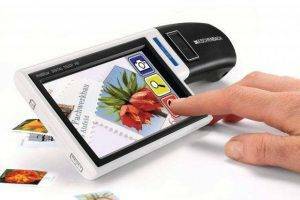 Identify supermarket products and money notes. For people who are blind, visually impaired, or have dyslexia, aphasia or other conditions. 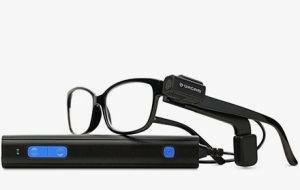 OrCam MyEye gives independence. The selection of helpful visual aids is vast! To name a few – there are large print materials, devices to create high contrast, “talking” features that read information to the person with visual impairment, writing guides, large print phones, etc… We are proud to supply an inventive collection of advanced low vision aids and customized options in our San Jose office. See the television and faces again with these simple to use tv magnifier glasses. With 2.1X magnification and adjustable lenses for each eye, you no longer need to buy a large screen television to enjoy your favorite shows. See your playing cards again, see to paint, and sheet music! 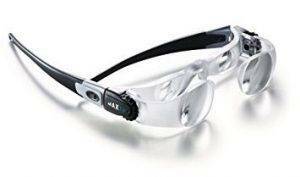 These 2x magnification glasses are ideal for close vision and are adjustable for each eye. 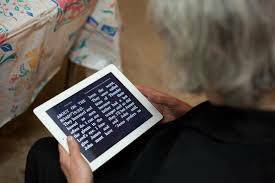 Special software on the iPad can help blind and low-vision users by using an iPad to have the text read out loud. We can help you learn more about this.